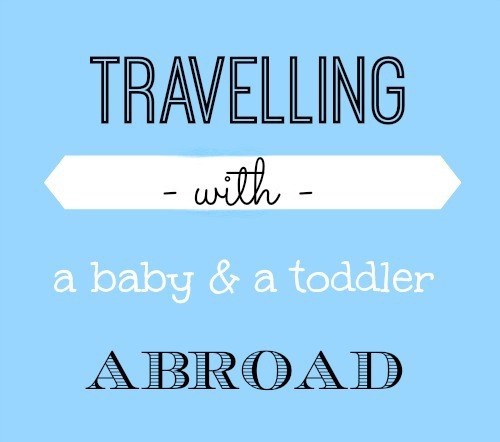 We all know travelling with children can be challenging. So many things can go wrong between point A and point B. More often than not you will be waking those children up far earlier than they rise naturally and putting them to bed minus their normal daily nap, far later than normal. This means to expect the unexpected and always be prepared! As I am about to take my 2 1/2 year old son and 1 year old daughter to the west coast of America, I am running through all the necessary “to do’s” in order to be prepared as I am going solo! I heard that gasp, but I am used to the long haul trips with Buba and got a great routine down, now just have to alter it for two. I have two arms right? I am a mother of routine and my children are Gina Ford babies all the way, I saw that eye roll please don’t hate me. But it actually works in my favor when travelling. I try to stick to their routine as much as possible. Get there earlier than normal, you will need the extra time to check in with children, get through security with your stroller, checking baggage in and passport check for international travellers. I always recommend taking the stroller to the gate, do not check it. You cannot possibly carry your baby, your toddler and all the bags alone. It’s easy to ask at checkin for a tag for your stroller, check at the gate and then it’s there in between all your flights to use for napping. Always keep the basket underneath clear and try not to hang too much on the handles if you are shopping in between flights. Going through security and at each gate is hard enough juggling a baby, keeping a toddler from running off, with your carryon bags hanging off your back and folding your stroller without having to empty it of it’s contents and find a place for your impulse purchases. Be organized. There are soft play areas at almost every airport I have ever been to. Find your gate, then locate the closest one, and let them run wild for as long as possible in between flights. Make sure you buy snacks, food or drinks for you and the kids from the airport. The plane can run out of things, and have very few healthy easy options for kids. Think about yourself too, you have a baby in your lap and a toddler next to you there is no place for a tray of food for you. Get yourself granola bars, and something to eat in the airport before you board. You don’t want the smell of that hot food come by you and you are starving with nowhere possible to put it. Change diapers and use the potty for toddlers before, during and after each flight. It’s better to be over cautious than to have horrible accidents. Some children do get diarrhoea when travelling, be prepared for this. You think it might not happen to you, it happened to me with Buba. It wasn’t pretty! Mini activities such as small coloring books, crayons, or colored pencils but not markers. You don’t want the seat in front of you getting a makeover, been there, it’s embarrassing to say the least. Mini sticker books. Mini storybooks, but none that have music or noises or are heavy. You don’t want to carry heavy items and your passengers will kill you if you bring that farm animal book aboard. Favorite toy/blankies, Missy Moo has a favorite ducky and Buba can’t sleep without his blankies so I will make sure I have them in my carryon to sooth them while they fly. Food/Drinks for all of you, as I said above you have no space to pull your tray down with a baby on your lap and a toddler next to you. Pack easy items like granola bars, or eat in the airport before boarding. Bring non sugary snacks, high protein for the kids to tie them over. Mini meals, and snacks drawn out over the whole day keeps them busy and satisfied. You don’t want a cranky hungry child on your hands. Pack extra, extra diapers, extra wipes, extra diaper baggies, extra clothes for everyone including you. Buba pooed all over me once and I had to wear the clothes for another six hours. It was awful. Also be prepared for diarrhoea from at least one child. Travelling into different countries, where there is different water, and food it’s bound to happen. Trust me! Have a mini carryon, inside your carryon. This is so important. When you travel with a baby and a toddler you are most likely going to get the bulkhead seats which means you will not have a seat in front of you to put the diaper bag under, it will be a wall. Therefore your carryon will have to go above your head and in times of hunger, need for a diaper change or a new distraction the seat belt sign will come on due to turbulence. It has happened to me so many times and resulted in a screaming child. Having a mini carryon inside your carryon that you can just pull out, that has one toy, one snack, one diaper and few wipes and that diaper bag just in case is a life savor. Keep it next to you in the seat or I put mine right behind my legs so the flight attendants can’t see it. Again we were on a flight once with Buba who pooed everywhere, of course the seat belt sign was on for two hours and we broke the rules jumped up for a quick diaper bag grab, got yelled at and then with everyone staring in disgust had to change his diaper right there in the seat. Trust this has saved me so many times. Make a section for the important stuff your wallet, keys, passports, papers, tickets etc. You don’t want these falling out when you are reaching for diapers or while pulling out snacks. I put all mine in a zipped pocket and use it only for these important items nothing else. Expect delays. When you are travelling so far, it is bound to happen. Expect poo accidents. Don’t be that one that’s not prepared, I was. Worse flying experience ever! It went on me, the seat, my husband, the travellers’ luggage underneath our seat, little to their knowledge. Awful. Expect to forget something. Don’t fret you can always buy it in the airport or when you land. It’s too late now anyways. Expect grumpy children, it is just one bad day and there is a light at the end of the tunnel called family or beach. The more relaxed you are about it all, the more your children will be relaxed. Don’t let them know you are getting worked up, even if you are sweating from the anxiety. Expect the seat belt sign to be on 90% of the time. Put that potty trained toddler in a diaper, you will regret it if you don’t. Expect no one will help you carry things so make sure you can physically push that stroller, carry that diaper bag and those suitcases. They may be checked in but if you are flying internationally you will have to reclaim your baggage and get it rechecked in at a different location. When someone helps you it’s a bonus, don’t expect it. I have had some tough travels while pregnant with Missy Moo, Buba was a baby on my lap and trying to juggle my carryon and rechecked baggage with no one to help me even after I asked. I use two large suitcase that can link together by a big clip. Expect your kids to be more hungry and thirsty while travelling, they will be up longer than normal. Expect they will need the bathroom more than normal due to all that more than normal thirst. Expect to be exhausted. You will not sleep a wink, clearly. There will be no watching a movie, or reading a magazine. There will be no nice relaxing meals in between flights. There will be no complimentary wine with your meal that you won’t get because you can’t put your tray down with a baby on your lap. Expect to feel rushed and stressed. Everything takes longer with kids. So you may think you have plenty of time in between flights but after you have changed diapers, coached your toddler through a poo on the big potty, fed them, grabbed a bite for yourself, and the bathroom for yourself, you will need to find your gate, and give them your stroller to prepare to board. Unless you have hours in between flights, in that case let them run wild. You see kids going crazy in the airports, you should pat their parents’ backs, they are running that energy off so they don’t do that on the plane. So you may roll your eyes at them but it’s much worse if they do it in a confined aircraft. Expect to have no room to do anything. Your baby will grab at your toddler’s food tray and knock it all off. Your toddler will scream because the baby is in his space, and on your lap. You will have no room to do much of anything. Prepare to be cramped. After reading all that, if you are still even reading at this point and I haven’t scared you off from travelling with your family, make it part of the vacation. Travelling with children can be fun, I promise. I know it is for me anyways. It’s what you make of it. Buba loves people watching, sightseeing, and hearing all the stories I tell him along the way. Being an expat, travelling is always going to be a huge part of our lives and I want my kids to enjoy it and not feel obligated or burdened by it. I tell Buba stories of me travelling as a kid with my parents. I point out funny things and make up fun stories about it in the airport. I get him to point things out to me and tell me a story. The more relaxed you are about the travelling, no matter what comes your way, the better your journey will be for everyone. I hope this will be helpful the next time you travel with your children whether you are travelling with a partner or alone like me. These tips can be used for a short trip, or long haul trips like ours. Wish me luck on Monday as I travel with my baby on my lap and my toddler next to me to the west coast of America, alone! I know call me crazy! Check out how to pack for families. Thanks Sam. Glad people are reading and liking it. It definitely helps me be prepared to share all my tips and experiences too. Can’t wait. You couldn’t be more right. Always depends on their mood that day!!! Hope I get a good day Monday. Hahaha although mm just had her mmr shot so probably not. Great post jenny, especially loved the bag inside the bag one….genius!!!! Oh yes I will never not have it on me just in case. Has saved me loads and loads of times already. Yes almost all airports have play areas for kids with jungle gyms and all sorts of climbing things. Revolutionary indeed. Bag inside a bag has saved me loads of times. Always that silly seat belt light on. Glad it helped. Sounds great to me. Thanks hunny. Can’t wait to see all my family. Oh yes I live by them. Not always huge but have slides climbing frames and mats down for kids to let off steam. Best ever. Preparing in advance could also amount to making your baby prepared for the changes in her sleep schedules that are foreseen. If your baby is used to sleeping in a quiet place but you foresee an outing to a noisier place, maybe you could help your baby adjust by allowing some noise around her at her sleeping time.